Sathiguru Amar Das Jee Maharaj is speaking to us today. O bhaaee - O brothers, so - that person, and that person alone is a Sikh, a follower, is sakhaa - a friend, is ba(n)dhhap - is a relation, j - if, gur kae bhaanae vich aavai, who aavai - comes into, the bhaanaa - the command, the will, the rules and regulations, the guidance of The Guru. O bhaaee, O brothers, those who chalai, who walk according to aapanai bhaanai, according to their own desires and will, and according to their own thoughts, vishhurr chottaa khaavai. Firstly they are vishhurr, they are separated from The Guru, from Waheguru. Khaavai means to receive, chottaa means punishment. That separation itself is a great punishment, but they wander as well, away and away from The Guru and Waheguru. Bin sathigur, without The True Guru, bhaaee - O brothers, sukh kadhae n paavai, you can never find true eternal happiness. Kadhae means ever, n means negation of that, paavai means to find. Never can you find that sukh, that happiness without The Guru. Then that poor forlorn person, fir fir - again and again, pashhothaavai - regrets. Those people who are dhaas, who are slaves of That Waheguru, who have devoted their life to serving The True Guru and Akal Purakh Waheguru God, they are suhaelae. Everything they do O bhaaee, O brothers, O sisters, they are suhaelae, they are blessed. Their life is full of eternal happiness. Not fleeting happiness, eternal happiness. Of their many janam janam, of their many past lives, the kilabikh - sins, and the dhukh - pain, are kaattae - cut away, removed. Aapae mael milaaee, Waheguru Jee Himself, The Guru Himself has mael milaaee, has united them with Himself. Rehaao - Sathiguru Jee says pause and think about this. Remember that this kutta(n)b, this family that you see will not go with you in the end. As long as we remember that, we won't fall into the chains. But Guru Jee says that the whole world has enchained themselves into this. bharam bhulaa sai(n)asaaraa. Sai(n)saaraa - this whole world, this whole universe is bhulaa - is deluded, in bharam - in this doubt. Bin - without, gur - The Guru, Without The Guru, ba(n)dhhan ttoottehi naahee. These ba(n)dhhan, these chains, ttoottehi naahee, cannot be cut through. Guru Jee is not telling us to leave the family, Guru Jee is telling us to cut the chains, cut through the attachment. Guramukh mokh dhuaaraa. Guramukh means those people who follow The Guru, who have fallen into the protection of The Guru, they find the dhuaaraa - the door, of mokh - of salvation, they are saved, they are liberated. And they are taken out of the many doors of attachment in this world. Karam karehi, those people who act and perform rituals, gur sabadh n pashhaanehi, and do not pashhaanehi, do not focus on, do not realise, and do not take into their everyday life The Guru's sabadh, The Guru's word, mar janamehi vaaro vaaraa. Vaaro vaaraa means again and again, mar means to die, janamehi means to be born. They are born and die again and again many times in reincarnation. O bhaaee, O brothers, this jag - this world, is palach - entangled, in what? Ho maeraa, into the idea of ego, that everything belongs to me, that I am the greatest. These are the thoughts affecting the world. Koe n kis hee kaeraa. Guru Jee says no-one belongs to anyone else, no-one looks after anyone else. That is the way of this world. Everyone is looking after just themselves. Those who fall into the protection of The Guru, who face towards The Guru, those guramukhs, mehal paaein, they find the mehal, the mansion, the house of God's protection, paaein - they find, this house within them. Gun gaavan, they sing the praise of Waheguru. Nij ghar hoe basaeraa, they are basaeraa, they live forever. Basaeraa means to dwell forever. Nij ghar means within the true home, that true home of Waheguru, that home from which we can never be kicked out, never be dragged out. They find a place there. Aithhai - in this world, someone who boojhai, who are realises The Guru's word, s aap pashhaanai, he or she understands themself. They understand who and what is within, that we are not this body, we are not simply this mind, there is a soul within, that true jot within. 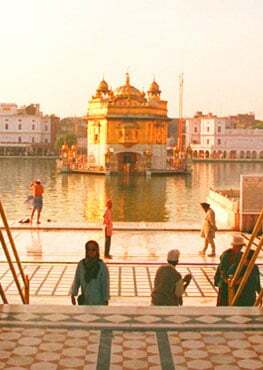 Har prabh - Waheguru Jee, Hari, The Lord, hai this kaeraa, belongs to that person, becomes his or hers. O bhaaee, O brothers, The Sathiguroo, The True Guru is sadhaa - forever, dhaeiaal - merciful. But vin bhaagaa kiaa paaeeai. Without bhaagaa, without good fortune, kiaa paaeeai, what can we receive? The Guru has the same nadhar, the same glance of grace upon all, sabh oopar. Oopar means upon, sabh means all. Eaek nadhar kar vaekhai, vekhai means to see. Upon all, The Guru looks with that same glance of grace. But Guru Jee says, jaehaa bhaao, according to the bhaao - the love and faith that we have, thaehaa fal paaeeai. Thaehaa, that is the type of fal, the fruit that we obtain. When the Sikhs that had lived with Guru Nanak Dev Jee like Baba Bhudhha Jee, Baba Bala Jee, other great gurmukh piaarey asked Sri Guru Angad Dev Jee what was different in the seva that Guru Angad Dev Jee performed to Guru Nanak, for them to get the gurgaddi, to be blessed with the gurgaddi, and Guru Angad Dev Jee simply said to Baba Bala Jee, what did you see in Guru Nanak? And Baba Bala Jee said I saw a great saint. Guru Angad Dev Jee asked Baba Bhudhha Jee the same question, and Baba Bhudhha Jee said I saw a Brahmgiaanee. Then they turned around and asked Guru Angad Dev Jee what they saw, and Guru Angad Dev Jee said, I saw God. Jaehaa bhaao, the type of faith, the type of shardhha that we have. Guru Angad Dev Jee laughed and said Baba Bala Jee, you saw a great saint and you became a great saint. Baba Bhudhha Jee, you saw a brahmgiaanee, you became a brahmgiaanee, with The Guru's grace, I saw Nirankaar God there, and Guru Nanak Dev Jee made me part of Himself. O naanak, those people who have The Naam, and when The Naam comes to vasai - to abide, in my mind, a(n)thar - within me, vichahu aap gavaaeeai. Then aap, this sense of myself, this sense of ego, this sense of pride, gavaaeeai - is lost. So in the hukamnama today, Guru Jee is urging us to follow The Guru wholeheartedly and to give up the chains of attachment, greed, hatred and evil.